While his Pirate Christian Radio conference was on, Chris Rosebrough (from Fighting for the Faith), had two insightful interviews with two ex-Hillsong members. His first interview was with Elisabeth from Oslo, her testimony how her church was taken over by Hillsong. The Power of the Pulse? 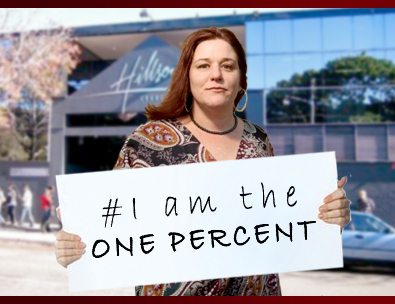 His second interview was with Tanye Levin from Australia, her testimony how her church was taken over by Hillsong. Here is the interview between Chris Rosebrough and Tanya Levin. It is not uncommon to hear Brian Houston, his leadership, and Hillsong’s adoring fans telling people, “judge not lest you be judged”, and “if you are without sin, cast the first stone”. And Hillsong would say that their movement never “demonizes” Christians for questioning the powers that be. At least up until now…. 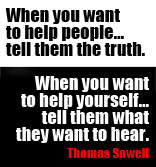 Leaders goal: Toughen up and lead when the heat is on; yet stay authentic and transparent. Better days are coming! Live your life in a transparent & authentic way. If you have nothing to hide, you have nothing to fear & nothing to lose! Leadership doesn’t bully. – doesn’t manipulate – doesn’t ‘control’ – & doesn’t crush or diminish others! Leadership leads! Let’s see how Brian Houston went. It’s astounding to think that someone like Brian Houston can sit on an annual salary of $300,000 a year and operate out of such willful ignorance. 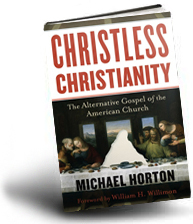 Not only that, our most recent articles looked at how far removed Hillsong is from the orthodox Christian faith. The first article below is a report on how Hillsong wrote the song ‘This I believe’. 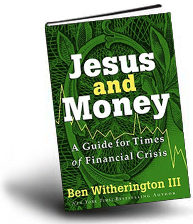 The second article is a testimony of someone’s experience at Hillsong explaning how they discovered their rich historical Christian faith once they left the Hillsong bubble. “I was a Christless, creedless, and clueless Christian in Hillsong”: A testimony of God’s grace. 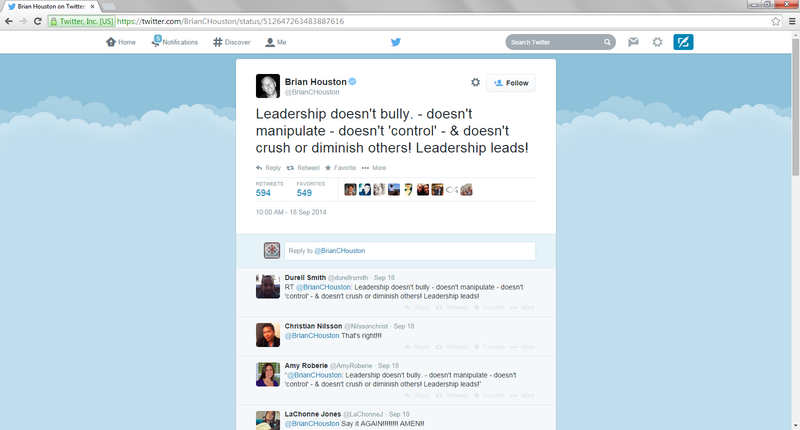 With all this in mind, we can begin to understand where Brian Houston is speaking from. 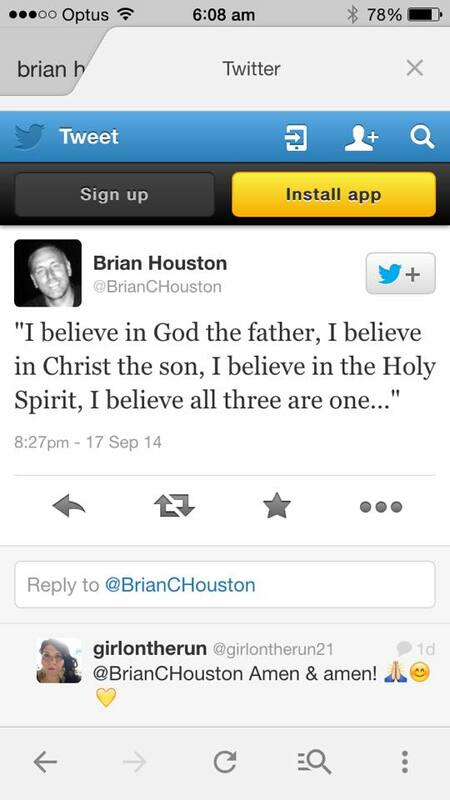 Below, Brian Houston tweeted lyrics from his church’s latest song, “This I Believe”. 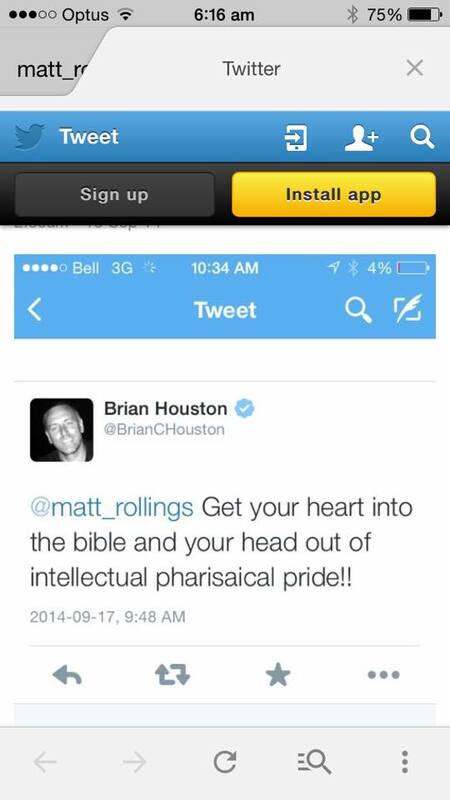 A commenter, Matt Rollings responded to Brian Houston’s tweet. Matt Rollings summed up our thoughts exactly on the issue of this song. Furthermore, Rollings bought Pastor Christ Rosebrough from Kongsvinger Lutheran Church into the discussion, also an apologist for his radio show Fighting for the Faith. 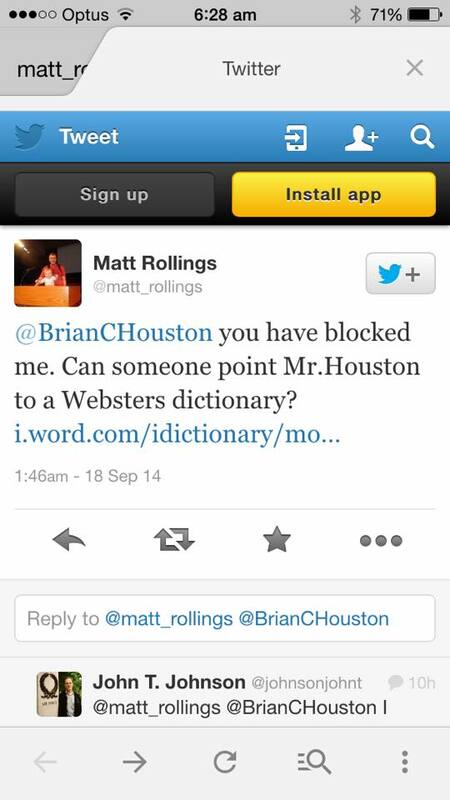 So what was Houston’s response to Matt Rollings? If you aren’t laughing now at least you should be raising your eyebrows with this comment. Brian, yes, you can find the word ‘modalism’ in both the Oxford Dictionary and Merriam-Webster’s Dictionary. 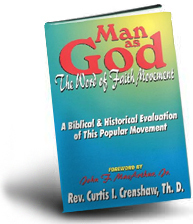 And you most definitely find the definition of modalism in Christian encyclopedias or systematic theology books. Obviously ‘the great white shark’ Houston felt out of his league and started chomping and thrashing around on Twitter. It is important to notice the words he used around “pharisaical”. Pride? Well, obviously. But intellectual? Being intellectual makes you a Pharisee? Weren’t the Pharisees false teachers who loved to parade a form of godliness (in a similar way before Brian Houston removed all his shocking comments from this Twitter conversation)? By the way Brian, nothing is ever ‘deleted’ permanently from the internet i.e. your ‘deleted comments’, you do realize that? 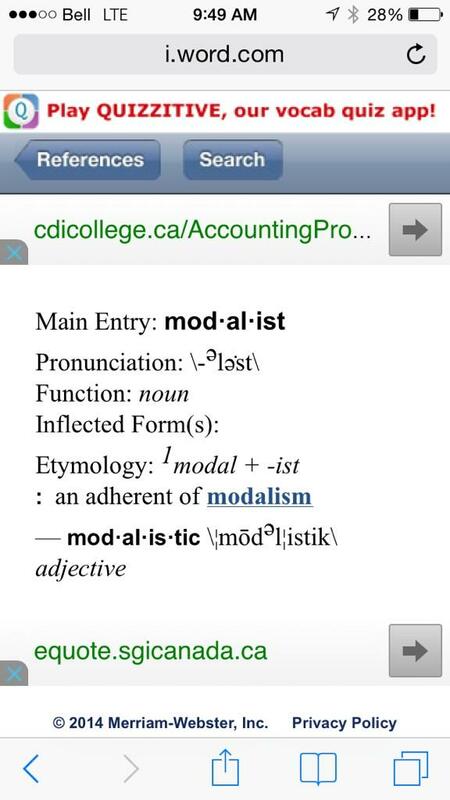 We found them as easily as we found ‘modalism’ in the dictionary. Just saying. 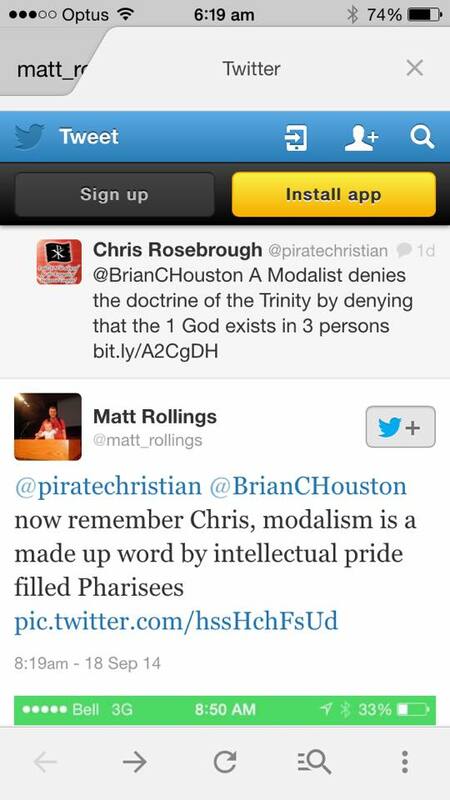 Ps Chris Rosebrough joined the ‘conversation’ to help explain to Brian Houston exactly what Modalism is, Matt having alerting Chris in the twitter stream as to what Houston had said earlier. 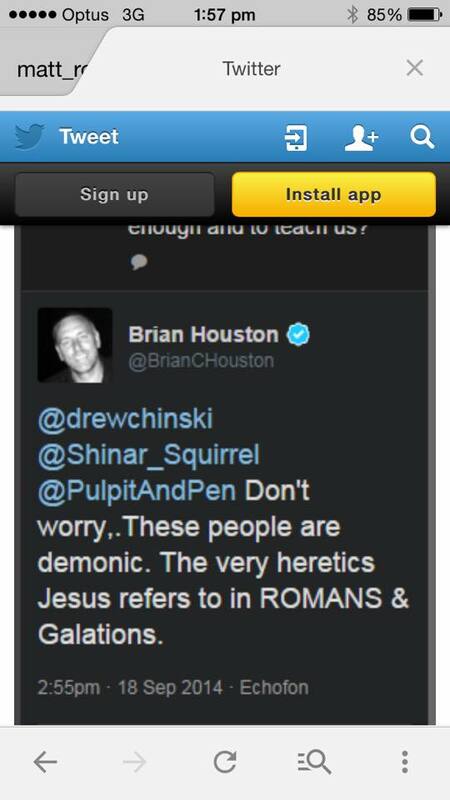 @BrianCHouston Brian, you have blocked me. I can’t respond to you. Please please!!! 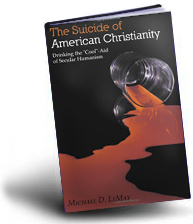 pick up a theology text book. The following is a transcript of a segment from Thursday’s Pulpit & Pen Program. Listen, if you’re a layperson I understand you may be like, “You guys are snobs, just because he doesn’t know a word.” Listen, if you’re layperson, if you don’t understand… I’m glad you listen to the Pulpit & Pen Program because you need to know what this means. But if you’re a pastor and you don’t know what the word means, get educated. A leader of worldwide movement and you don’t know what modalism is? Why are you the leader of a worldwide movement bounding off towards anything, let alone heresy? How did Brian Houston become a pastor? When Brian Houston became a pastor, did he look a lot like the guy that should have preached that night and they accidentally put him behind the podium instead? Is there a body double? Is he a Manchurian candidate? 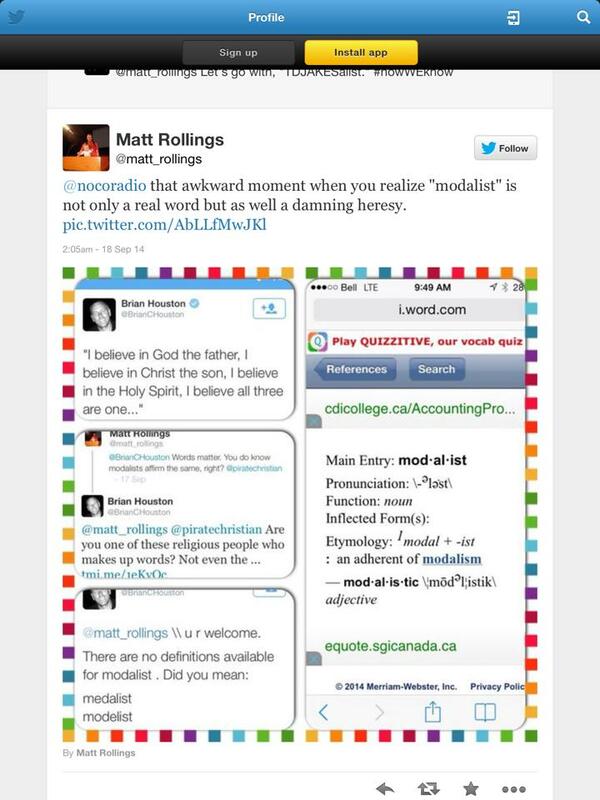 He doesn’t know what modalism is, so he actually looks it up and he says “there are no definitions available in the dictionary for modalism?” He said [to Matt], “I don’t even see the definition anywhere? 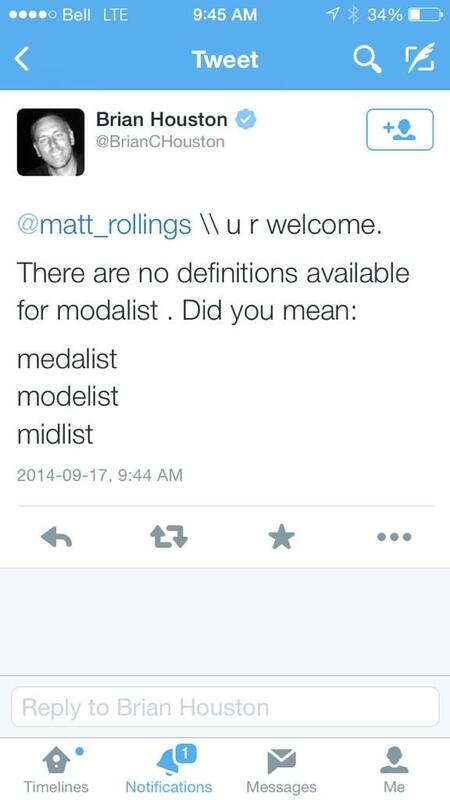 Did you mean medalist or modelist?” And then, finally his response was to (of course) block him for being one of “those religious snobs who throw around big words” like “modalist” – three syllables, for crying out loud. It’s three syllables. 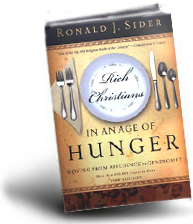 Is it too much to ask that we project leaders who are people that have read a theology textbook at some point in their life? Who might know what ‘modalism’ or other major heresies are? Because you can quote the creeds all day long, Nicene Creed or the Apostle’s Creed, to make yourself sound Orthodox, but you haven’t the ability to provide an apologetic against Oneness Pentecostal heretics like TD Jakes? You see, Satan hates the Trinity – he can’t stand it – and every cult under the sun attacks the Trinity (Mormonism Jehovah’s Witnesses, etc…) every single cult attacks Trinity. So you’re the leader of a movement? Was has come of us? That’s why you, sir -Brian Houston – are in the Daily Downgrade. @BrianCHouston The P&P staff gives our apologies. What do you mean by “evil”? We can’t find it in the dictionary. Is that a word? Right. So Jesus refers to Christian ministers and elders as heretics in Romans and Galatians… Huh? 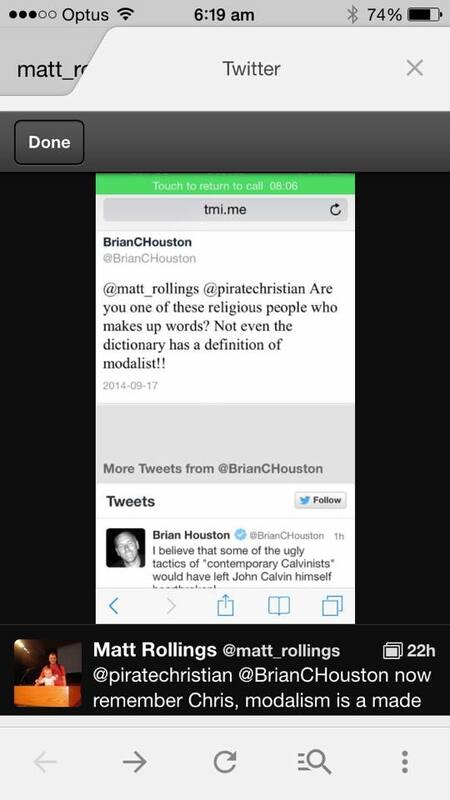 What is Brian Houston thinking? 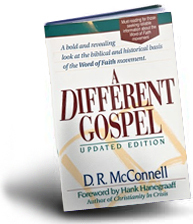 Didn’t the Apostle Paul write Romans and Galatians under the inspiration of the Holy Spirit? Now Brian likes to think of himself as being transparent. Authentic. Rising above, when under fire. So what did you think Brian Houston did when he was ‘under fire’ by Christian pastors, brothers in Christ who rightly, and with polite restraint, corrected Brian Houston’s ignorance about modalism? What does he do? He deletes his tweets. Calls other Christian pastors demonic. Sounds like he has the “spirit of a pioneer”. We thought we would leave you something that Matt Rollings put together with his encounter with Brian Houston. Edit: Houston has now responded. 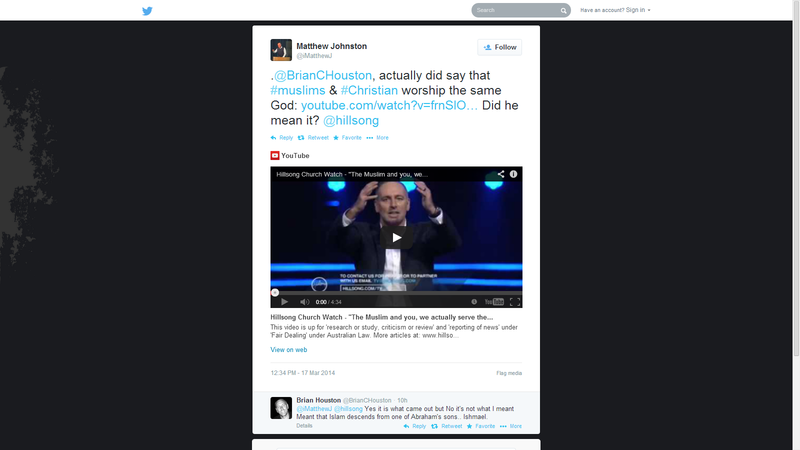 His lack of further clarification is actually confirming our suspicions that Brian Houston is pushing a secular agenda to expand his own personal Hillsong empire and his master’s domain. He has given us enough evidence to suspect this to be true. 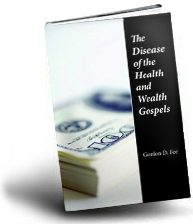 For a long time now, Hillsong has not been showing the signs of tolerating the Christian gospel, the proper handling of God’s Word nor tolerating Christians who try to correct those in error the way the bible instructs them to do so. Will Hillsong remain God’s Church or the People’s Church? If secularism is against Christianity, then a secular church is also against Christianity. Before reading this article, you need to read this article. @iMatthewJ @hillsong Yes it is what came out but No it’s not what I meant Meant that Islam descends from one of Abraham’s sons.. Ishmael. I wanted to address the issue directly myself and agree that the statement was indeed clumsy in the moment and did not clearly communicate my intention. I was simply making the point that Christians and Muslims both believe that the God of Abraham is their God. I apologise for any confusion and obviously my allegiance is to the Lord Jesus Christ alone. We are very grateful that Brian Houston has decided to take the time to be responsible over his error and send out “corrections”. However, we will need to address these “corrections” in a separate article. Especially when you see confused comments from Christians under his correction. @bjornole777 @BrianCHouston @iMatthewJ @hillsong same God, different view. It has concerned us that Hillsong and C3 members who have tuned into this controversy on various social media websites are also confused on this. Some Hillsong and C3 members believe that the Islam and Christian God are the same. This should not be a surprise to anyone considering these ‘ministries’ are secular institutions that tolerate anything but biblical Christianity. It concerns us that Christians are more upset about Brian’s tiny statement and not offended with his sermon that twisted every single scripture for his own purposes. It’s the equivalent of Christians complaining about a speck of salt in a saltwater pond, thinking that the pond is offering fresh water. 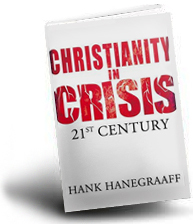 While Houston offered corrections to his statement, Chris Rosebrough from Fighting for the Faith recently reviewed and corrected Brian Houston’s controversial statement around the issue of Muslims and Christians serving the same God. Below, you can hear Chris Rosebrough critique Brian’s comment 57 minutes into his program. 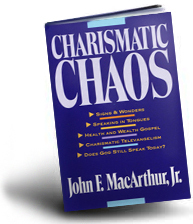 • Charisma Mag Explains Who the Enemies Within Are? 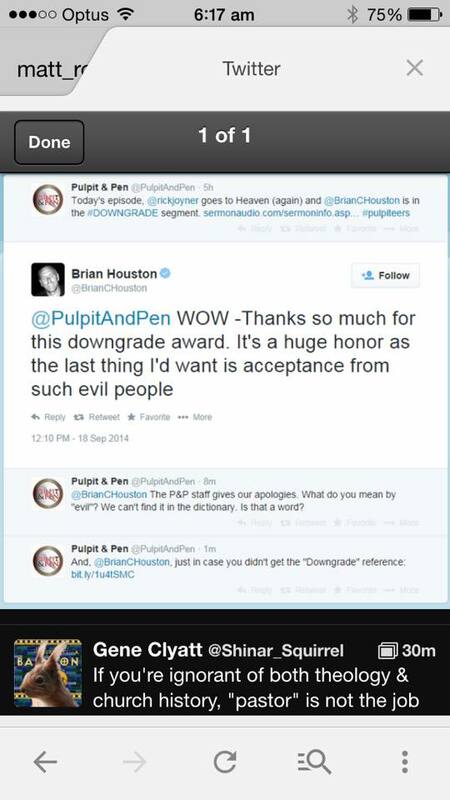 Chris Rosebrough has done another review on Brian Houston. We’ve even played this sermon to a few people and people have difficulty understanding what Brian Houston is talking about. Episode 1 of the Fighting for the Faith video blog. This episode deals with Carl Lentz and the bigger problem of image vs. substance in the celebrity pastor culture of much of the Body of Christ. 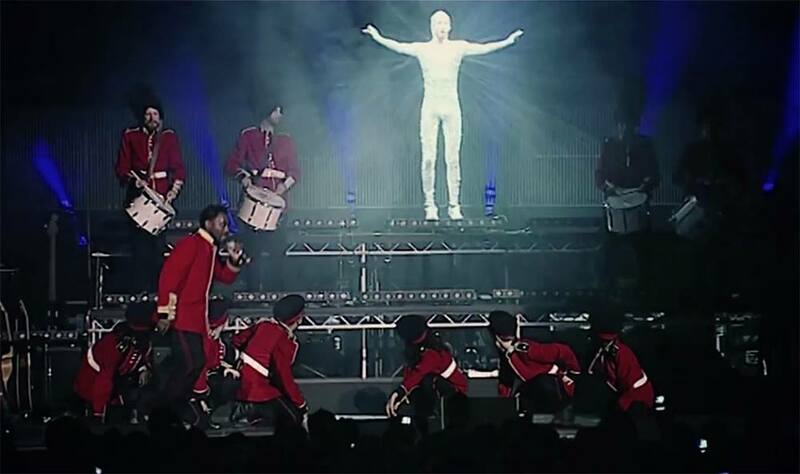 Source: From vimeo.com/83440952, Carl Lentz: Image vs Substance, Accessed 06/01/2014. Chris Rosebrough recently reviewed Brian Houston again. The critique starts at 40:00. What are your thoughts on Chris Rosebrough’s critique of Brian Houston?